June in France in special. Beautiful. Evenings are soothing and invitingly lingering. Start off a dinner (or a lunch) with a cool fresh papaya pineapple salad, drizzled with a mirrin and rice vinegar vinaigrette. I am a more than novice watercolorist..you are so inspiring~Your photos are equally delightful.Thank you so much. Ah, it’s so good to drop by and find you home! What a lovely June evening picture. My husband and I spent the month in Paris and I am filled with French spirit. I didn’t have any papaya while we were there, but the other ripe fruits were heavenly– melon, cherries, strawberries. This dressing looks like it might go with some other fruits, as well. Yum. A wonderful refreshing salad, a lovely idea to try out. How envious I am of your June weather. Our’s in the nation’s capital, (Ottawa Canada) has been very rainy, cloudy and at times cool! As a result,We haven’t had much patio eating weather. Hopefully July will be better. Your salad is a bit of sunshine! Oooo, that looks so fresh and delicious!!!! 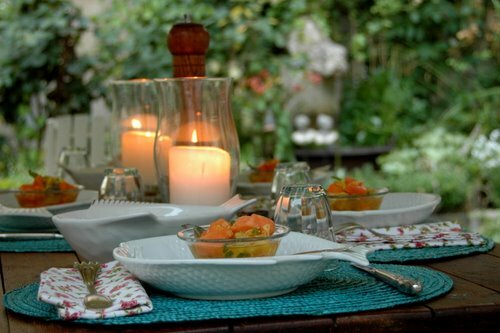 The idea of an outside dinner in the garden….not good at all. We are freezing here!!! yum! this looks stunning and the combination of flavours should be great! pineapple and papaya are the best thing for boosting your digestive juices, certainly something you need for a long, French lunch/dinner… ah, i wish i was there! wow! That salad looks fantastic. Great summer recipe. 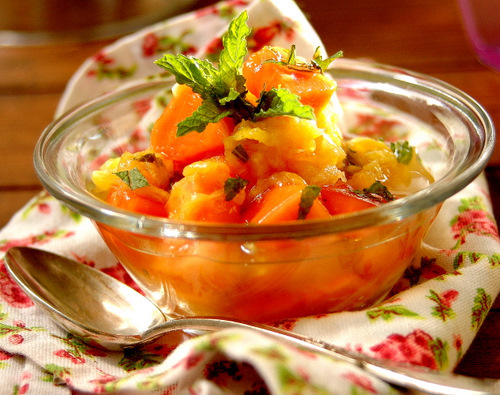 I adore papaya … a perfect mouth-watering salad for a warm summer evening here at the lake! Yum–how delicious that sounds, and how visually appealing you make it, too! I’ll have to try that. Beautiful table. 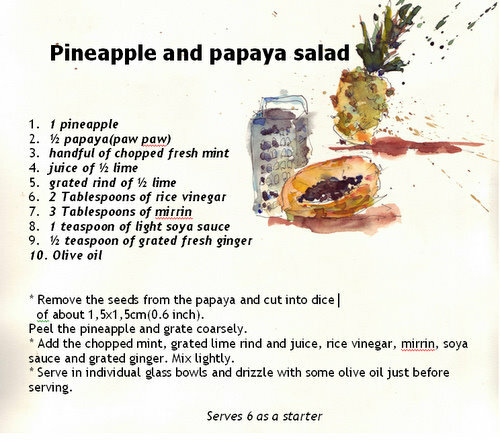 I love to do papay salad too but in different version, this one you showed looks so delish, might as well try this. BTW, I’d like to invite you to join us at the Krazy Kitchen for the Cultural Connections, all about foods from different parts of the world. Yours here would be a great entry. Oh what a pretty table! Lovely recipe. Never tried papaya with pineapple, will give it a shot.